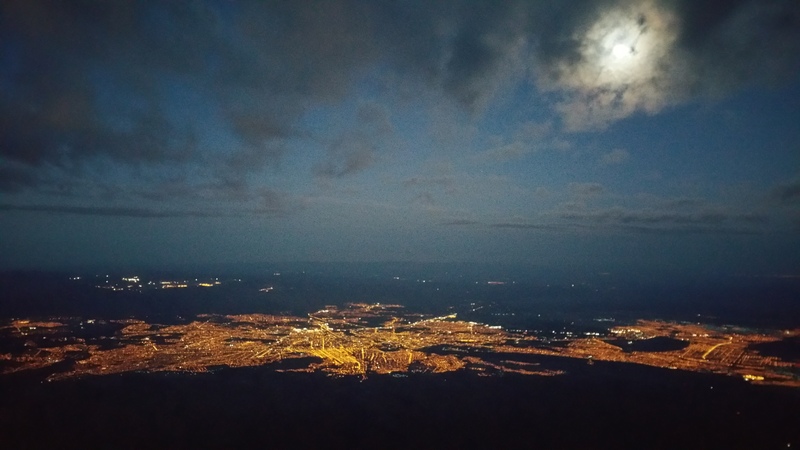 The 6-hour bus ride from Cabanaconde to Arequipa was straight forward (and cheap at only 17 soles or ~$5) and by nightfall we arrived to what ended up being our favorite city in South America thus far. 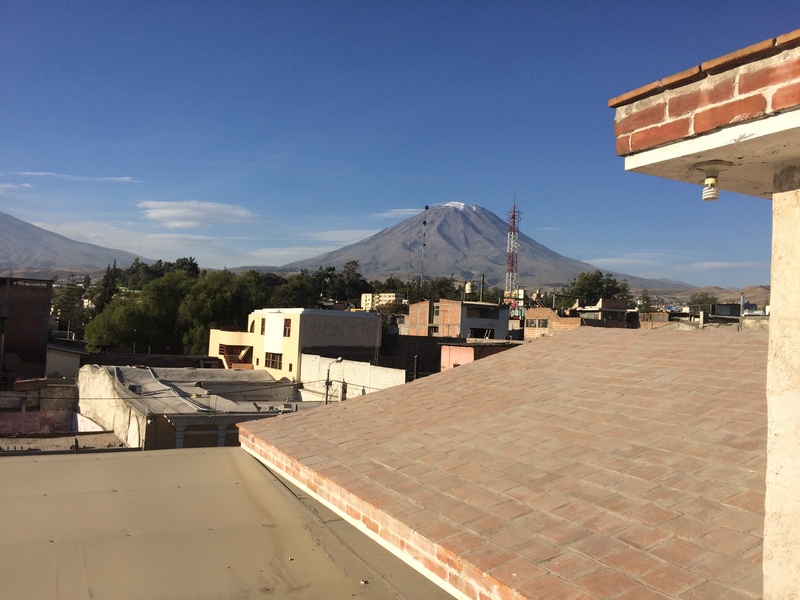 Arequipa, the second largest city in Peru after Lima but third most visited city after Lima and Cusco, has pleasant weather year-round like California. 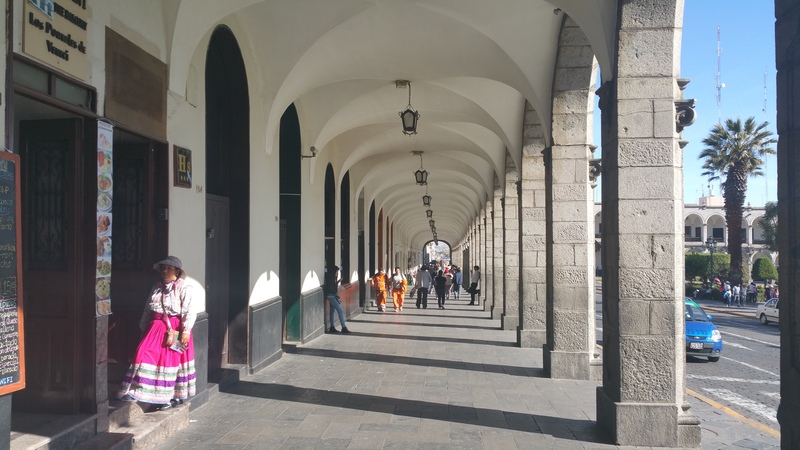 Beautiful architecture surrounds the Plaza de Armas, and three side-by-side volcanoes in the distance set the backdrop for the charming city. 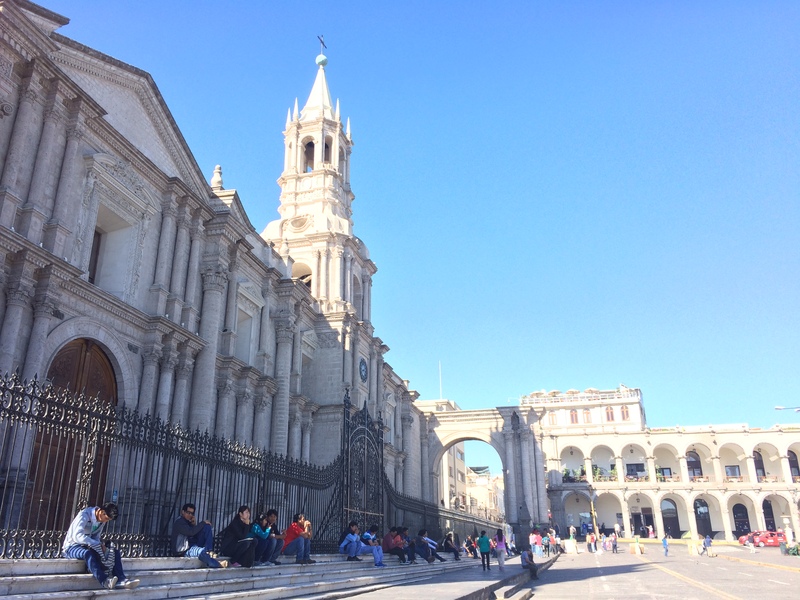 Arequipa has a fraction of the tourists found in Cusco, making it a more pleasant stay. In addition to cheap eats at local markets and the streets, there were numerous modern, tourist-catered restaurants, bars, and cafes. 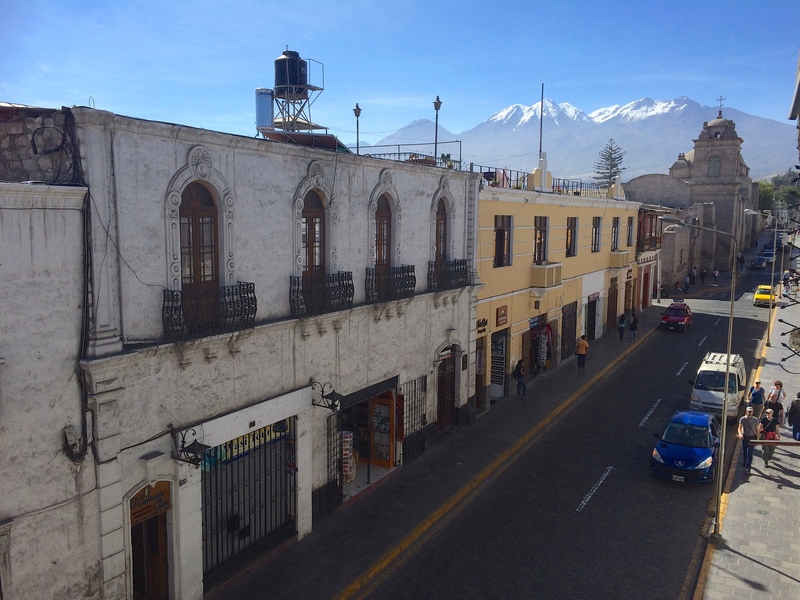 Most of our time spent in Arequipa was at our favorite cafe, crepe, or chocolate cake shop on the rooftop patio or roadside balcony. 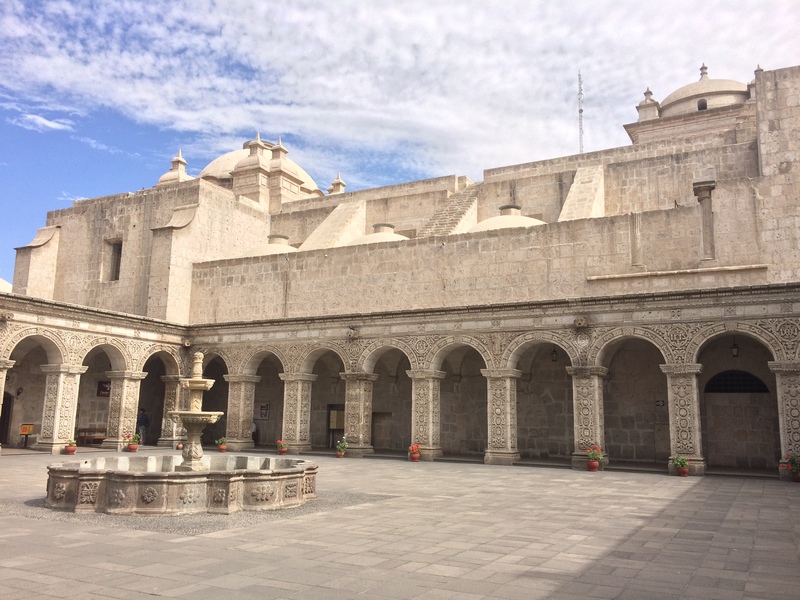 Not only was Arequipa an easy city to settle into, its surroundings offered plenty of exciting excursions for the outdoor adventurer. 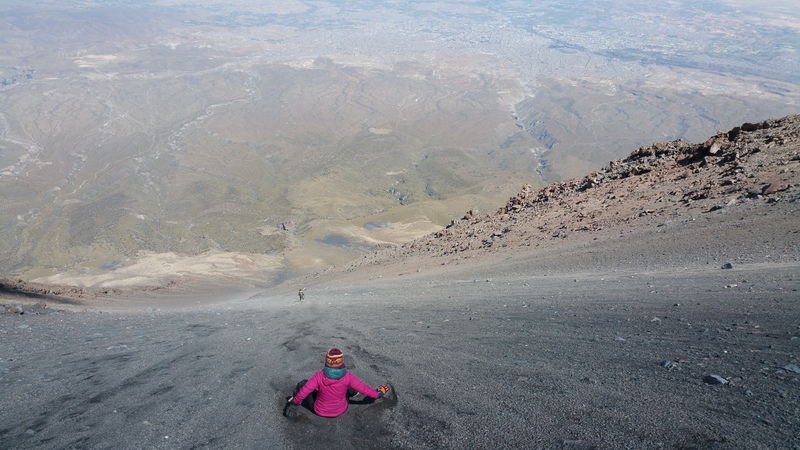 After gazing at the three volcanoes Chachani, El Misti, and Pichupichu (in order from tallest to shortest) in the distance, we nervously decided that we wanted to summit El Misti. 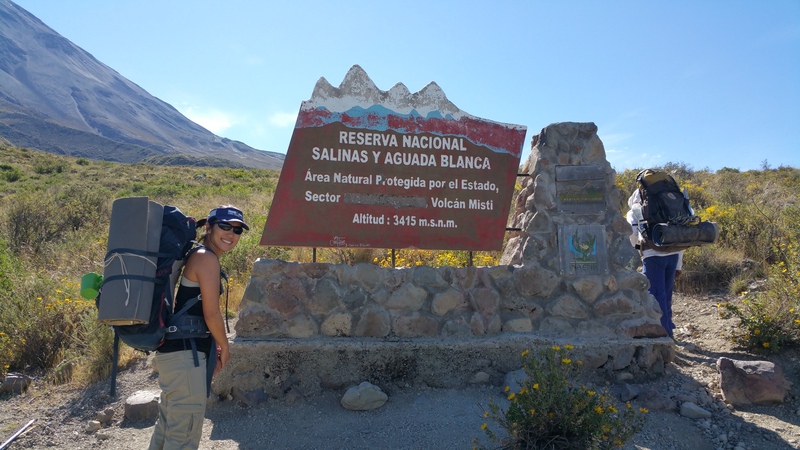 Little did we know that sumitting El Misti would not only be the hardest hike of our lives (so far), but one of the hardest things we’ve ever accomplished in life. 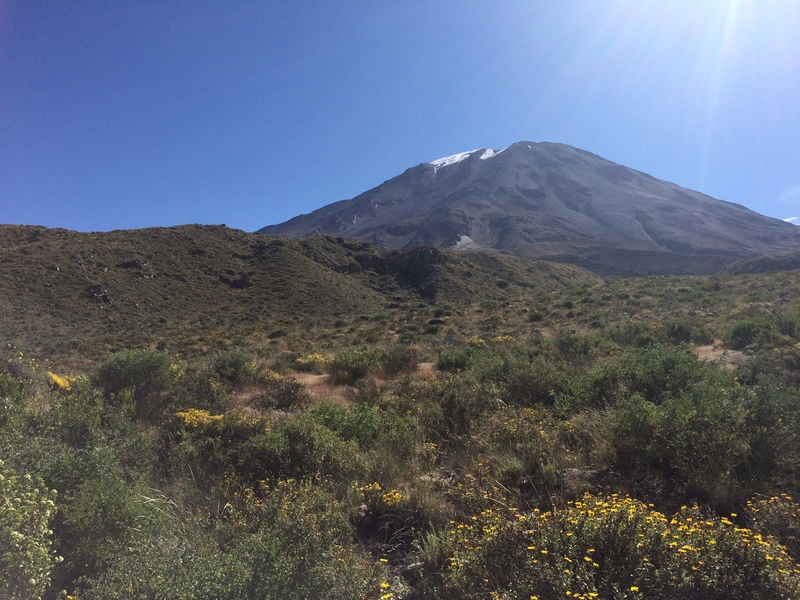 With its almost perfectly symmetrical cone, Misti rises to 5,821 meters (19,100 feet)–just about 200 feet short of the famous Kilimanjaro! 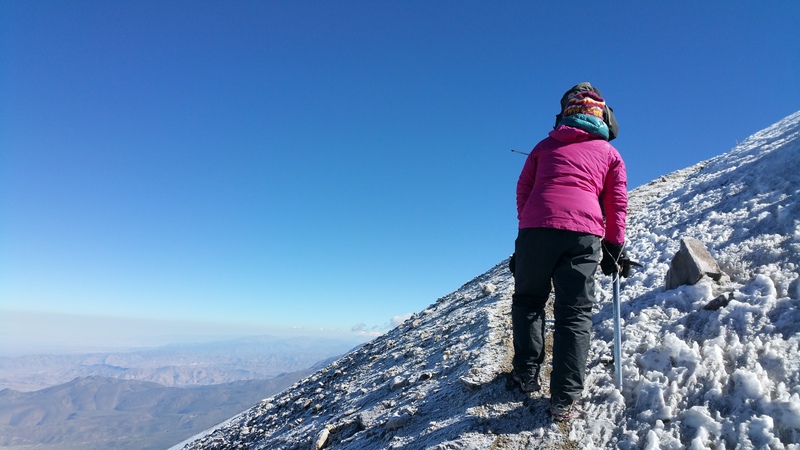 Only a couple dozen or so hikers per week attempt to summit Misti. Not all make it due to acclimation issues. 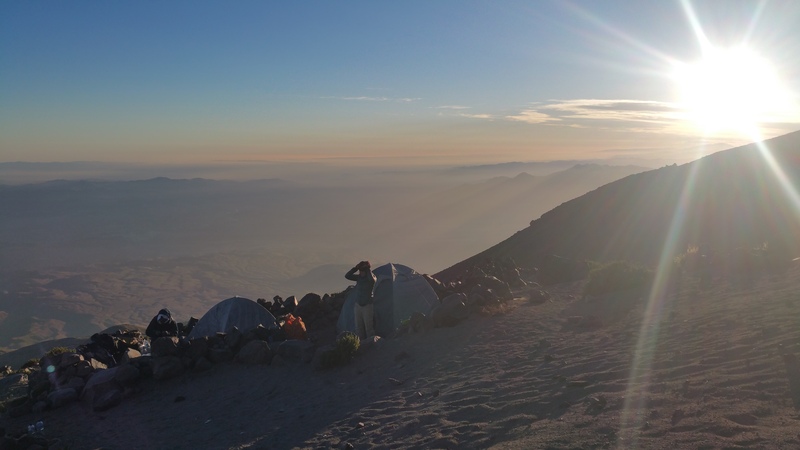 Although the trailhead starts at 3,415 meters, the 2-day/1-night trek takes hikers to the summit in less than 24 hours. 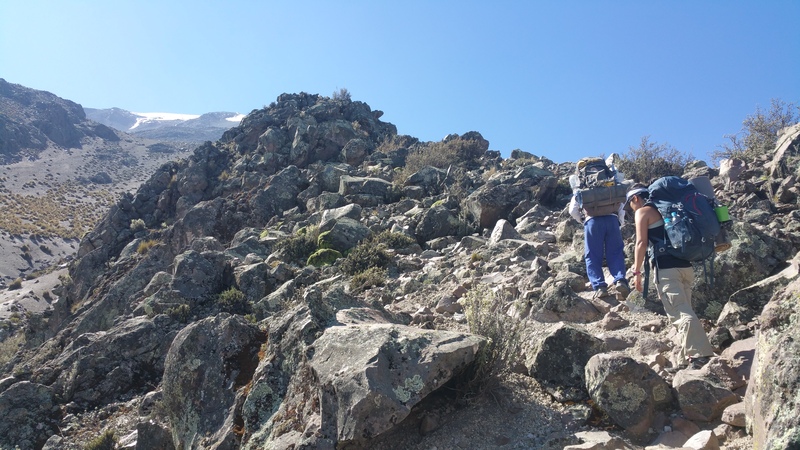 The 2,000+ meter elevation gain within that time span typically leaves many vomiting and nauseated with throbbing headaches, but since we had already been at high elevations for a month, we felt confident that acclimation wouldn’t be too much of an issue. For $130 each, we went with a guide from Incadventura. 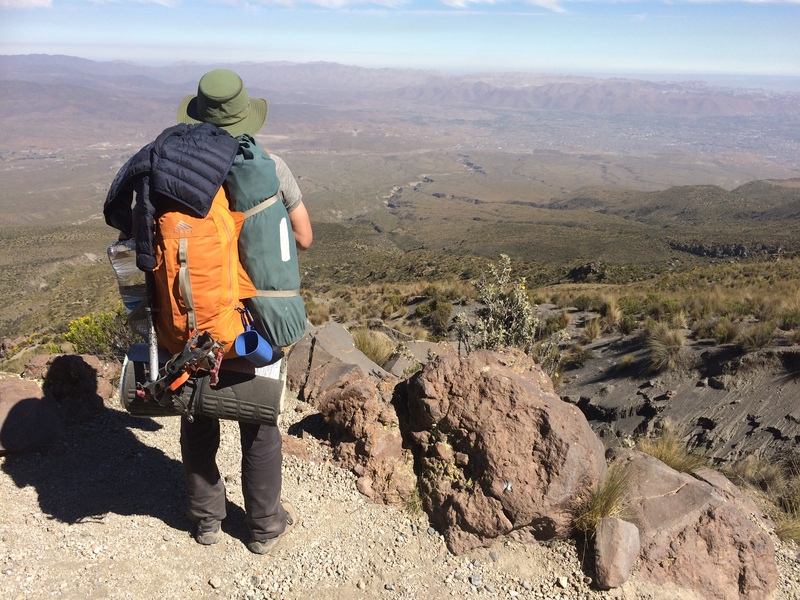 (At first I thought it was a bit pricey, but people spend over $1,000 to do Kilimanjaro, which has roughly the same altitude but is 5 days longer.) 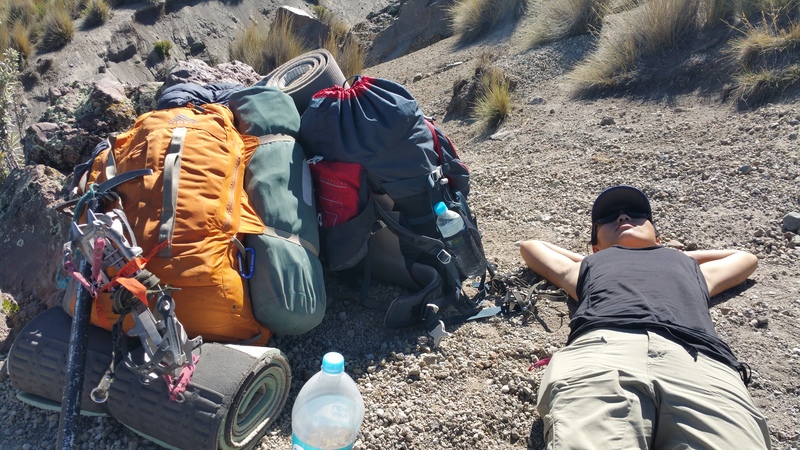 Like in Torres del Paine, the hike is done without porters. 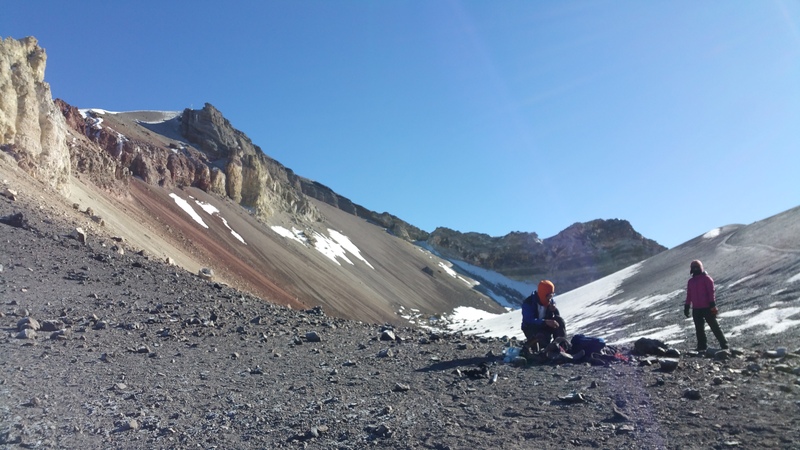 We had to carry all our clothing, sleeping bag and pad, tent, food, snacks, crampons for the ice, and ice axe. But unlike other hikes we’ve done, this hike had absolutely no water along the trails. We each had to carry 5 liters of water (for a total of 10 liters, about 22 lbs), but Chris ended up carrying most of my water because my back couldn’t handle the weight. Due to the steep path and high altitude, we slowly trudged up Misti one step at a time. Much of the ascent included scrambling over steep piles of rocks. We took breaks about every hour on the way to camp. We made it to camp by late afternoon. As the sun set behind the volcano, the temperature dropped dramatically. Our campsite. There was only 1 other guide and couple, also from San Francisco! By the time our modest dinner of spaghetti and soup were ready, it was completely dark and freezing. 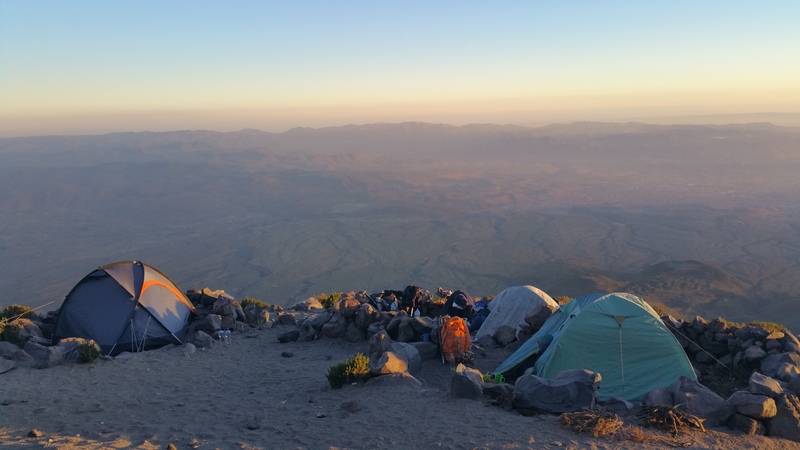 With a campsite at about 4,700 meters, the weather was unforgiving. We all huddled together around a tiny cooking stove, seeking protection between walls of rocks. Right after dinner we crawled into our sleeping bags in preparation for a 2am wakeup call to start our summit at 3am. But little did we know how cold it would be. Our rental sleeping bags were not rated for the subfreezing temperatures, and we spent most of the night curled up in fetal position and unable to sleep. After only perhaps a couple hours of miserable sleep, we were woken at 2am for tea. The moon was full and bright, which allowed us to hike in the dark without our headlamps. However due to the lack of sleep, we both almost fell asleep while hiking up, stumbling clumsily over some lava rocks. 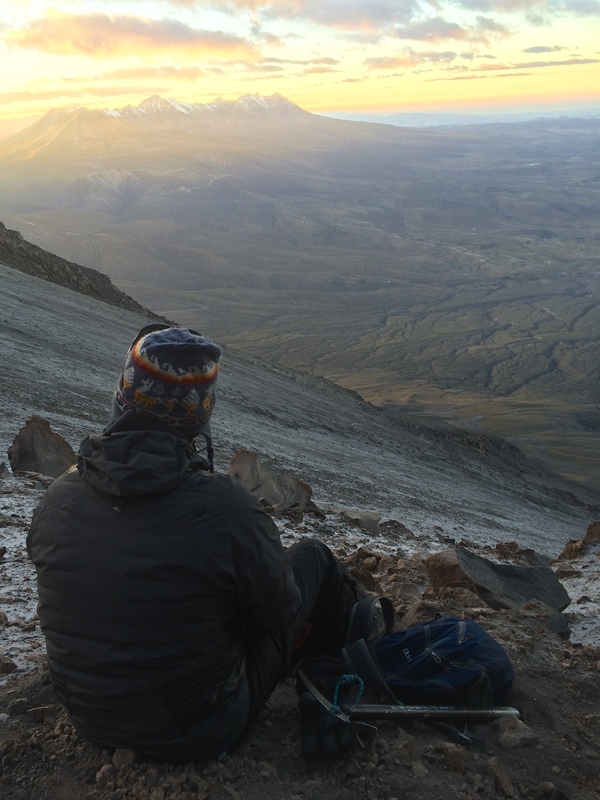 The time between the start of our hike and sunrise was perhaps the most brutal of the hike. With the cold air and high altitude, I was forced to take breaks every half hour. Our water froze on the way up, and frost even formed on Chris’s eyelashes and eyebrows. Every time we took a break, we forced ourselves to gnaw on our frozen snacks. At that point I started to doubt whether or not I could make the summit. The cold, lack of sleep, exhaustion, and over-exertion on the body was playing a toll on my mind, but Chris encouraged me to go on. 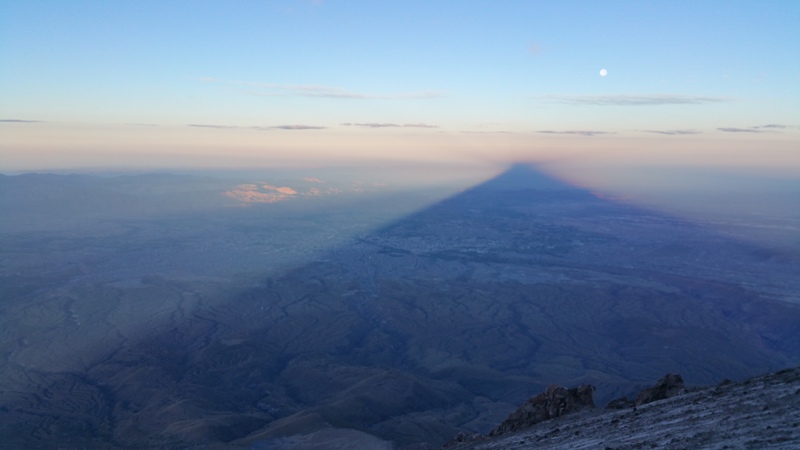 During one of our breaks on the steep trail, we watched in awe from Misti’s dark shadow as its neighbor, Pichupichu, was illuminated by the early morning sun rays. 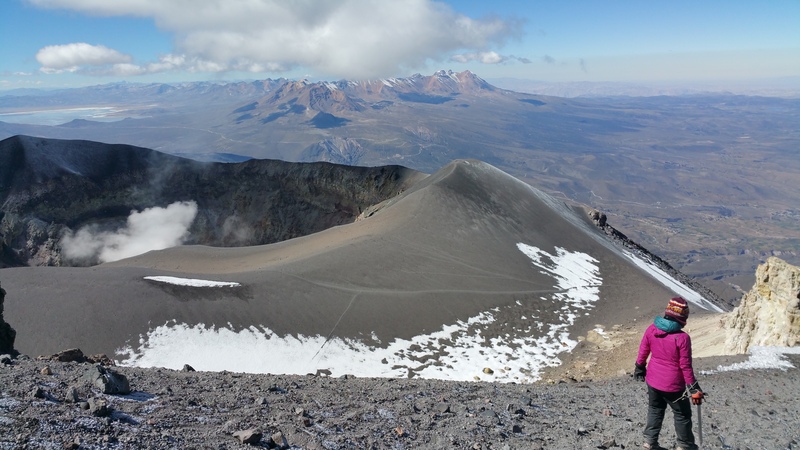 With many more hours, long breaks, and lethargic trudging up the volcano, we arrived at the center point between the two highest peaks of Misti. Here, we put on our crampons to hike the final path to the highest summit, as seen on the left. What should have taken 45 minutes took me an hour, as the path was the steepest, I was at my height of exhaustion, and I was gasping for air. And we finally summited. I remember seeing this giant cross from afar, knowing just how close I was, knowing that I was actually going to make it. 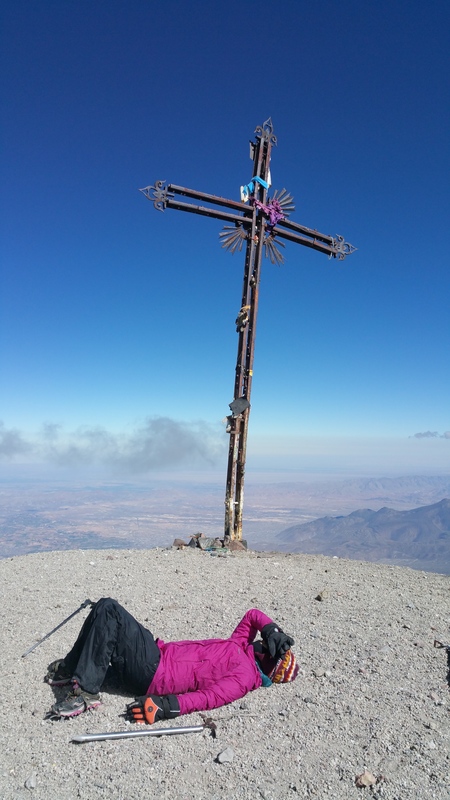 As soon as we reached the cross, I sprawled myself on the ground, panting, slightly delirious from exhaustion, lack of sleep, and exertion, relieved that the worst was over, but hysterical knowing that we were only halfway done and still had to return the same distance we came up. 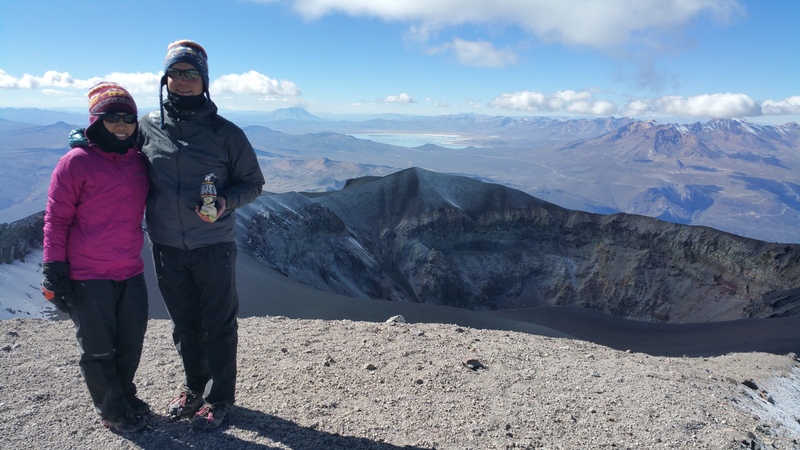 I finally found the energy to stand up again to take a shot from the summit looking down into the volcano. It was quite incredible watching the smoke and smelling the sulfur actively spitting out of the volcano. Believe it or not, descending was fun! Instead of taking the same steep, rocky trail back down, we “slid” down the dark, volcanic ash for over a mile. The experience was on par to running down a sand dune. 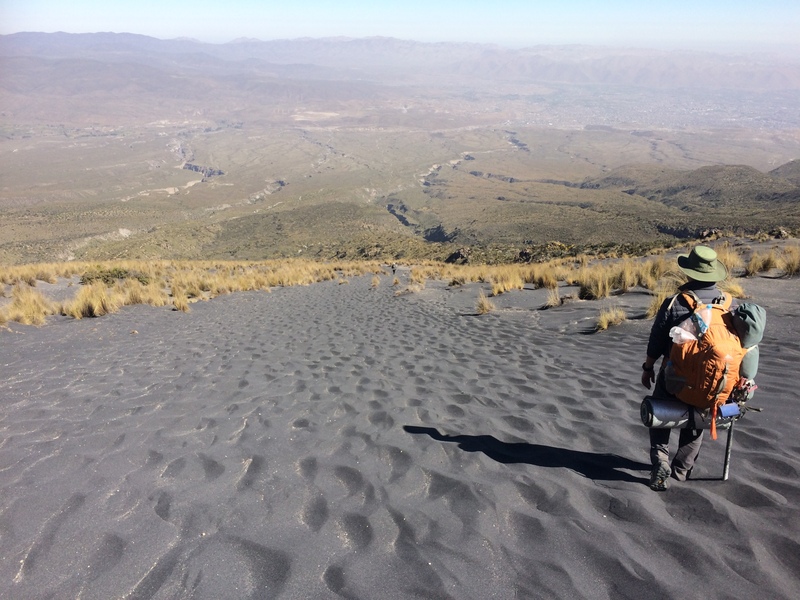 The volcanic ash was ankle-deep and we are still finding ash in our shoes a week later. We will never forget the less-than-24-hour summit to El Misti. We sweated and struggled with the weight going up. We shivered and barely slept, and then we staggered up the mountain in the dark. We drank our frozen water and gnawed at our frozen food. I gasped and panted for air. We blistered our toes and feet and pushed our knees beyond their limits on the descent. Were we glad we did it? YES! Would we do it again? Probably not. But after this brutal trek, we knew we were more than ready for the Inca Trail we had booked in the upcoming four days!